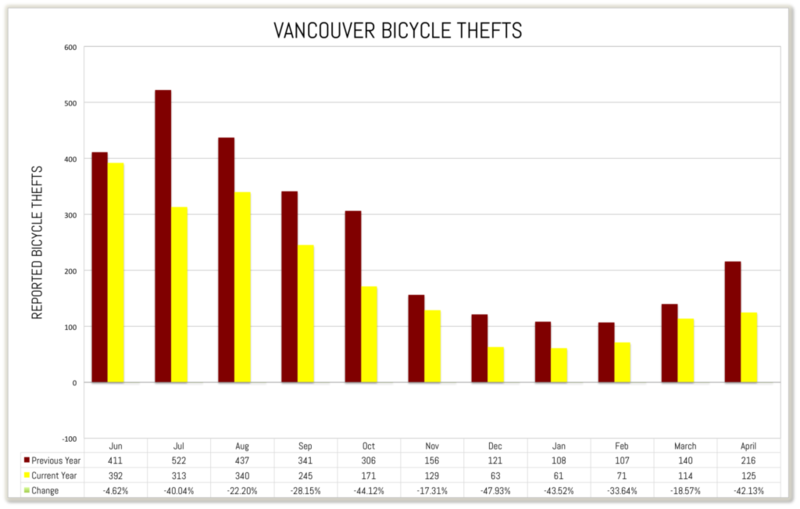 Vancouver, BC – May 29, 2017 – Kicking off Bike to Work Week today, Project 529 issued results from their focused attack on the bike theft epidemic in Vancouver. Every month since last year’s Bike to Work Week has seen a reduction in theft reports compared to the previous year in the City of Vancouver. Overall, 841 fewer bikes were reported stolen versus the previous year representing a 35% reduction of reported theft. During that same period, over 200 recovered bicycles have been returned to victims of theft. Following the Canadian launch in October 2015, the 529 campaign has spread rapidly across BC agencies, schools and bike shops. The 529 Garage is an anti-bike theft platform that brings law enforcement and the cycling community together to attack this problem via a smartphone application and cloud services. The system allows cyclists, shops and organizations to register bicycles in under five minutes. If a bicycle is stolen, the victim can alert the local cycling community and law enforcement with just a few taps from their smartphone. The system also gives law enforcement modern tools to locate owners, communicate with victims and cooperate with partner agencies across North America. Vancouver spearheaded the effort in BC approximately 18 months ago and it quickly spread to other agencies. Today, over 25 municipalities and 100 bike shops across the province have endorsed the program, quickly adding over 50,000 BC bikes to the 529 Garage database. This collection of agencies onboard with the program today serve over 50% of British Columbia’s population. This week during Bike to Work Week, over 50 events will take place across the province to help cyclists protect their bikes and give law enforcement an increased ability to return bikes to owners. Cyclists can also self-register their bikes with the 529 Garage app for free, or on the web at www.project529.com. Small, tamper-resistent decals called “529 Shields” signal to would-be-thieves that the bike is registered and can assist law enforcement with recoveries. 529 Shields retail for $12.99 (CAN) and can be found by visiting most local bike shops. Project 529’s vision is to cut the $2 billion bike theft epidemic in North America in half by 2025. The 529 Garage is a cloud-based service offered to partners in the cycling industry, law enforcement and education markets to attack bicycle theft in their communities. Since 2013, the 529 Garage has provided free, 5 minute registration to all North American cyclists from their smartphone applications and website. The 529 Garage is the largest bicycle registration database in North America containing over 500,000 searchable bikes. The company additionally partners with other online bike registries like Bike Index, Operation Hands Off and bike registry.com to give its users a single interface to multiple bike databases. In 2017 the company merged with the oldest North American bicycle service, The National Bike Registry. Project 529 is based in Seattle, WA, Vancouver, BC and Washington DC.